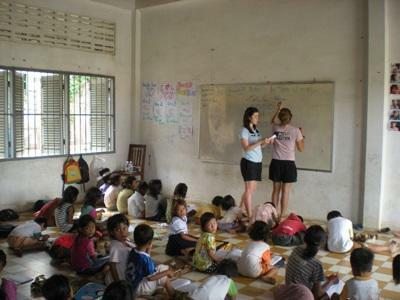 Teaching in Cambodia with Projects Abroad is an ideal way to make a difference in the lives of disadvantaged children. You do not need any formal teaching qualifications or a TEFL certificate. We do not require any previous teaching experience, as Projects Abroad has fully trained staff to guide each volunteer's experience. After years of devastation, many Cambodians now have better access to schooling and the government is encouraging education for both girls and boys. However, the number of children in need of education in the capital city of Phnom Penh is very high. The free schools that do exist are often overcrowded, understaffed, poorly resourced, and sometimes out of reach. Whether you want to volunteer during your gap year, career break, or as part of an extended vacation, you will have a vital role to play in improving the lives of Cambodian children through education. Projects Abroad works to improve the lives of some of the most neglected children in Cambodia by working closely with many local NGOs who focus on education. There are many difficulties associated with sending children to free schools and so children often receive their education within NGO schools. English is an important skill for Cambodians to learn and there is currently a great demand for English education. A good grasp of English means access to better jobs and ultimately a better future. It is here, and in the charity funded schools that volunteer teachers can make a huge difference. Volunteer teachers in Cambodia work in local NGO schools, giving you the chance to help these children improve their prospects. You will teach free English lessons in the classrooms at the schools, also helping with the many daily duties and activities. Volunteers can also teach subjects such as art, drama, music, and sports. Please see our Care in Cambodia page for more information. Classes are normally small with about ten to thirty children per class. The limited size allows you to give personal attention to each child. Due to the shortage of teachers, you'll normally have your lessons alone without a teaching assistant, but there will be other staff around to help or translate if needed. The staff themselves will also benefit from practicing their English with a native speaker. The ability to speak English will help improve the future of these children. You will teach younger children the basics while helping older students polish their skills and enhance their confidence. The attention and care you provide is an enormous benefit to them and we hope you will take the time to prepare and structure lessons. Being prepared will give you extra confidence and insure that you and your students get the most out of your experience volunteering in Cambodia. You can read more detailed information about the aims of the project in our Cambodia Teaching Management Plan. Whatever skills and talents you have, teaching in Cambodia will give you the opportunity to put them to good use. Be imaginative with your teaching to make learning fun and enjoyable. Through the use of materials, games, and songs you can engage the children and make them eager to learn. There are also opportunities for volunteers to get involved with teaching other subjects, such as music and dance. Please note that you can also teach Japanese full-time. The impact you have on the lives of the children with whom you work will be long lasting. Overall, you will also be part of a much wider volunteer network that is working toward making a positive contribution in the local community. You can join the Teaching Project in Cambodia for less than a month if you don't have time to join us for a month or more. This project has been selected by our local colleagues as being suitable for short term volunteering for both the host community and the volunteer. Although you will gain a valuable cultural insight and work intensely within the local community please be aware that you may not be able to make the same impact as someone volunteering for a longer period.